How Do I Properly Dispose e-Waste? Stop! Wait a minute! Raise your hand if you think you have been hoarding electronic waste for the past few years. Yes! That’s right! That includes the old monitor you are looking at right now thats sitting on in corner of your office. E-waste removal is a big problem in Australia because people can’t seem to let go of a perfectly working machine, or do they? Did you know that according to the E-Waste Fact Sheet 2009 of Clean Up Australia Ltd, e-Waste disposal is one of the fastest growing problems in the continent? People started to notice it as a problem in 2008. They found out that there is an estimated 37 million computers in our landfills. To date, e-waste removal continues to be a growing problem of the environment. 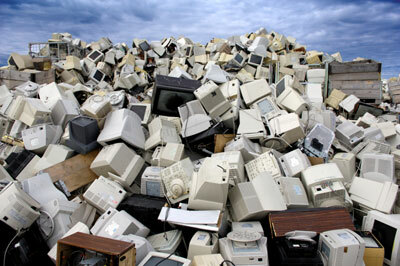 If people are hoarding e-waste in their homes, how come there are so many in our landfills? The answer: There are just too many of them! If this is the case, how can you contribute to the reversal of this worldwide phenomenon? Well, we cannot do away with gadgets such as cellular phones, tablets and computers. We need them for work and leisure. We are born in an age that these electronic devices have become part of our need to thrive. What we CAN do to help the environment is to properly dispose them when their time runs out. That’s right, there is a proper way of disposing a TV, a DVD player or a computer monitor; and it is not handing it over to your grumpy neighbor! 2.Call the Rubbish Taxi for Rubbish Removal Sydney We will be more than happy to help you dispose your e-waste, or at least point you to a drop off center where you can throw your e-waste. If you do not have time to go to a recycling center, you can call us in to handles such services. Just a word of caution: not all removal services handle e-waste disposal so make sure you ask them about it and see there recycling procedures. This is advisable if you have already hoarded too much clutter. 3. Environment Matters : Whether you are doing a small renovation at home or just trying to get rid of all the rubbish and clutter, always remember to do your part in helping the environment. You will not just beautify your home, you will also help Mother Nature. Friendly, professional, helpful, quick, quiet and efficient. I couldn't have asked for better service. People are so quick to contact you when they're dissatisfied, so I thought it might be nice to hear from a happy customer! I will absolutely recommend your company to anyone wanting rubbish removal and, of course, use you again if needed. The guys at Rubbish Taxi have been great! They came in and cleaned up all the rubbish from my recent renovation in no time flat. Saved me alot of time and a sore back. Thanks again guys ! Great job done in a straightforward way, nice and early in the morning so I could go straight to work with a clear mind & a clear home. I've been using Rubbish Taxi for a couple years now to clean up after myself.. The guys are hard working, reliable and just a good bunch of lads. They come highly recommend from me. The men that came were friendly and really quick, even shoveled left over dirt into the garden. Can't thank you enough, we will be recommending you to all our friends!